Sumatra Island is the sixth largest island in the world located in Indonesia. This island is so famous in the world so a Krzysztof Kowalczyk made ​​a pdf reader by the name of sumatra pdf. 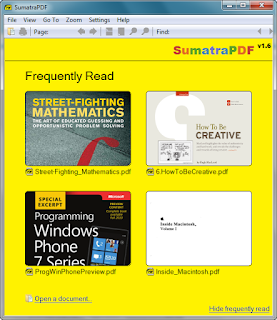 Sumatra PDF is a lightweight and easy to use to read a variety of file types including PDF, XPS, eBooks (ePub, mobi), CHM, DjVI and Comic Book (CBZ and CBR). Another advantage of sumatra pdf other is an open source software so anyone can use. 0 Response to "Download Sumatra PDF 2.2.1"